Dreadbit Games and Ripstone Publishing have released Ironcast for Mac, Linux, and PC today. Featuring intense match-3 and roguelite features, Ironcast is set in a Victorian Steampunk setting. The player gets to pilot a Steampunk mech while using the Match-3 to power different functions, such as shields and weapons. 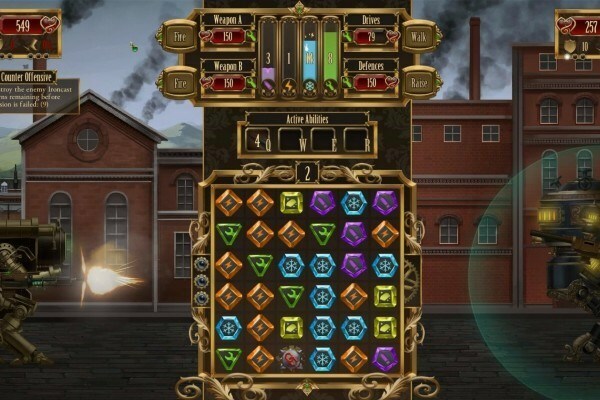 Unlike its spiritual predecessor Puzzle Quest, in Ironcast you only get one life. Ironcast is available on Steam and the Humble Store for $14.99 but there is currently a 30% launch discount.